This February I chaperoned a trip to the Historic Triangle in Virginia with two other teachers. The three of us enjoyed the company of nine students from our high school, Desert Christian, in Tucson, AZ. This trip was orchestrated by one of our seniors for her capstone project. All seniors must complete a capstone project that either gives back to the community or is beneficial to the school or its students before they can graduate. For this capstone project, the goal was simple: take Desert students on a field trip of a lifetime where they will learn about our nation’s origins while also discovering God’s providence and engaging in meaningful fellowship. The Historic Triangle includes Jamestown, where the English first established a permanent settlement and thus, the first capital of Virginia, Colonial Williamsburg, the second capital of Virginia and first major “city,” and Yorktown, the last major engagement of the Revolutionary War and where the British surrendered to the Patriots. Here is a larger map to include the current capital of Virginia, Richmond. 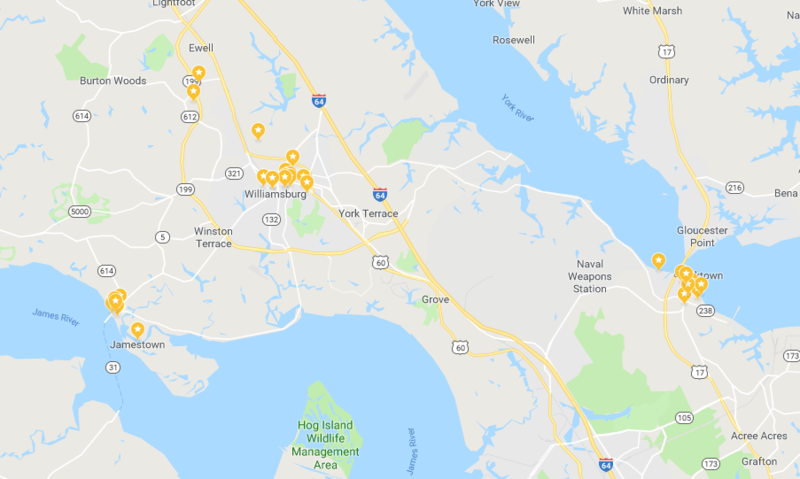 The 12 of us spent seven days exploring these three historic areas, even throwing in a quick jaunt around William and Mary College. We spent our nights at an Air B&B, ate family style meals around a great table, shared life stories and participated in many shenanigans. This is a trip none of us will ever forget. We learned, we laughed, we played, we sang, we explored and we shared of ourselves. I am grateful to have been asked to come along on this journey with some of the most amazing people! Below is a 6-minute video of our trip. Earlier this month my US History classes visited a local retirement home, Fellowship Square, to interview the WWII and Vietnam veterans residing there. Obviously, listening to real stories from the people who experienced them is a better learning opportunity than me attempting to recount war history in the classroom. I am grateful to Chaplain Al Story, who has helped me arrange this extremely beneficial field trip for the last two years. Not only do the next generation of students gain a deeper understanding of history, but the elders in our local community are able to share their stories and impart bits of wisdom they might otherwise not get the opportunity to do. Here are screenshots of the PDF the class put together as a result of our time spent with these wonderful veterans. Field trips bring history to life; they take classroom learning to the next level, where students can touch, feel, and truly ingest content. I love taking students on field trips, and at Desert Christian High School, I have the freedom to do just that! This month we’ve been discussing the era in American history called Westward Expansion. As a part of our studies in this era, we have explored the reasons for the European migration west. One such reason was missionary work: spreading the word of God to those who had not yet heard it. In Tucson, AZ, where our school is located, we happen to have a missionary church still standing from (actually even before) this era. 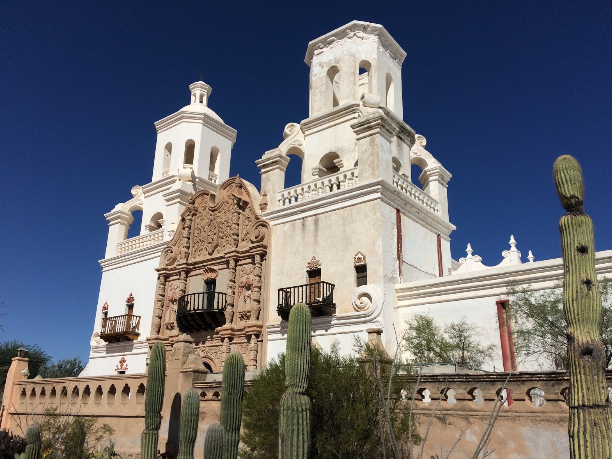 Founded in 1692 by Father Francisco Kino, San Xavier is quite the historic place to visit. Mission San Xavier, a part of New Spain, became a part of the new Republic of Mexico in 1821. Mexican material support for missions was non-existent, and in 1837 San Xavier’s last resident missionary in the 19th century departed the premises. Franciscan administration of all missions in the region came to an end in 1843 and secular clergy assumed responsibility for the churches, a circuit-riding Mexican priest visiting San Xavier perhaps once a year until the Mission became a part of the United States in June, 1854 with approval of the Gadsden Purchase. 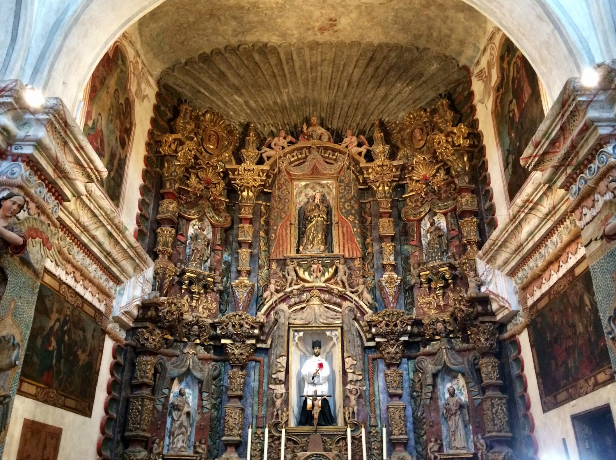 *On October 24, I had the pleasure of visiting, along with my US history class, the aged beauty of the San Xavier Mission. In all of its timeless design and intricate architecture, I could enjoy both design and history in an effortless blend (two developing interests of mine). Father Kino was the founding priest of the San Xavier mission. Though his activity in the mission itself might not have been as directly apparent as some might assume, his actions in establishing San Xavier were significant to US history, or more specifically, westward expansion. *Father Kino was a man of sacrifice and compassion. He committed his life to the pursuit of the well-being of others. Aside from being the founding priest to the San Xavier Mission, Father Kino contributed much more to the surrounding area. In addition to San Xavier, Father Kino founded 20 other missions, however he never built a church. Hailing from Italy, his dream developed into wanting to become a missionary, and when a traumatic event enveloped his life, causing him to become ill, he cried out to God, swearing that if he recovered he would devote his life to God. Ironically, he only came to the San Xavier church about five or six times at most. He passed away in 1711 and was buried at Magdalena De Kino.